Are you ready to give the noisy, gas-guzzling lawn mower the heave-ho? Unless your lawn is the size of a postage stamp, an electric lawn mower is most likely the right replacement. Then there are also the environmental considerations. “Using a typical, gas-powered lawn mower for one year can pollute as much as 43 new cars driven for a year,” the executive officer of the South Coast Air Quality Management District noted previously. You have probably already received periodic energy company solicitations to turn in your old gasoline-powered mower for one that runs on electricity. Perhaps you have been held back by old wives’ tales of low power or the fear of running over the power cord. Take heart, I have made the switch and so can you! It all starts with choosing the right electric lawn mower that meets your needs. A corded electric lawnmower is very light — usually between 30 and 70 pounds, depending on accessories — and therefore extremely easy to handle. You need an accessible plug, preferable on the outside of the home. Frequently these gardening tools feature a 12-amp motor and a 14-inch to 20-inch mow width. 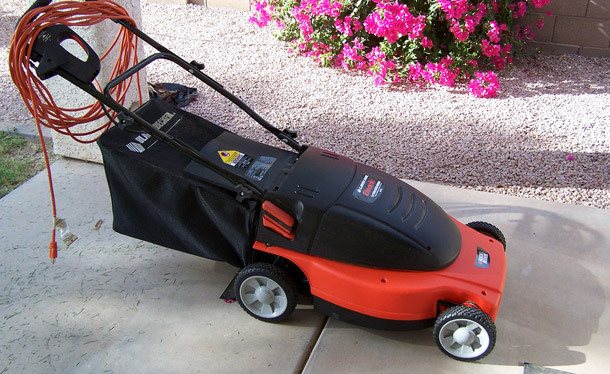 If you have a smaller yard, and if you can commit to planning your mowing pattern with the cord in mind, this is an easy-to-use lawn mower for the backyard. Cordless electric lawn mowers rely on a rechargeable battery for power. It is always a good idea to have two batteries — one to keep on the charger and the other one for the lawn mower. Since the battery is heavy, these mowers are also a bit heavier than their corded counterparts. Cordless lawn mowers are a good choice for yards that are large and for homeowners who are concerned about the danger of running over a cord. The latter is the reason for my choice of a cordless model. King County defines grass cycling as the practice of mulch mowing. You leave the grass clippings on the lawn, where they supply the soil with nutrients as they decay. The steady supply of nitrogen to the soil has the added benefit of cutting down on the amount of fertilizing you need to do to keep the lawn looking healthy throughout the year. Opt for an electric mulching mower, which does a good job cutting the clippings numerous times before letting them fall to the ground. The only reason why you might choose a bagging mower instead is your schedule. Unless you can commit to a regular lawn-mowing schedule, a mulching mower may not provide you with the best appearance for your lawn. Longer grass does not mulch quite as nicely as well-kept grass blades. You may see clumps and larger pieces of weeds if you forget to mow for a couple of weeks during prime growing season.